This inspiring candy watermelon flavor delivers amazing aroma with sweet watermelon taste. . 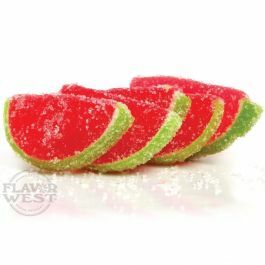 This flavor adds an enticingly delicious and refreshing watermelon taste in your candy making and baking treats. The flavor taste in your mouth never disappoints. Type: Candy Watermelon Water Soluble Flavoring. Ingredients: Natural and Artificial Flavoring, and Propylene Glycol. USP Kosher Grade Flavoring. Usage Rate: 15-20% for E-use. Flavor suitability: Desserts, pastries and baked treats, yogurt, ice cream, candy and more. Specific Gravity: 1.14 No Refunds on Flavoring. Like a Watermelon Jolly Rancher! This is basically the watermelon used in a Jolly Rancher. The other watermelon is sweeter, also candy-like, but not at all the same.